The all refurbished Ruca Calhuafe Lodge is located in North Patagonia at 31 miles from Puerto Varas and 44 miles from Puerto Montt. 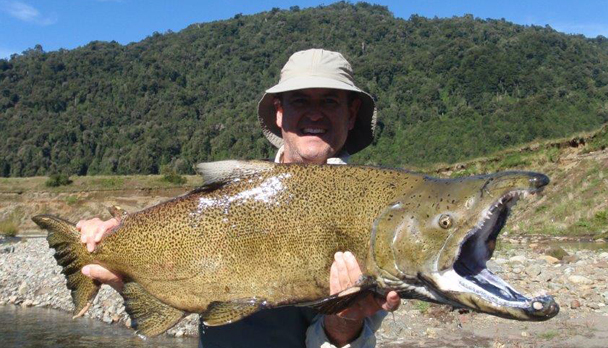 The area is very profitable for all kind of trout and salmon due to the amount of rivers and lakes bounding the area. Ruca Chalhuafe is an ideal spot for those looking fish variety and quantity. Ruca Chalhuafe is located in North Patagonia at 31 miles from Puerto Varas and 44 miles from Puerto Montt. The area is very profitable for all kind of trout and salmon due to the amount of rivers and lakes bounding the area. With capacity to accommodate up to 20 anglers, Ruca Chalhuafe is an ideal spot for those looking fish variety and quantity. 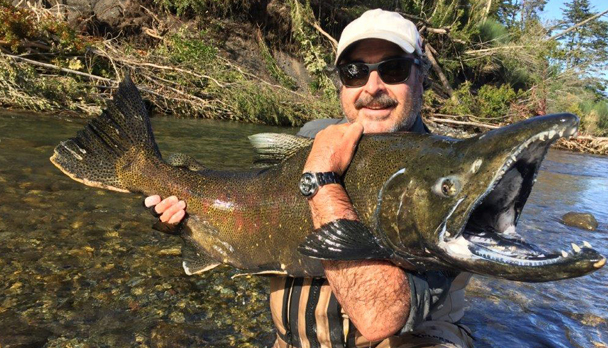 In Puelo river, boat and wade fishing at the best spots of the river, where you could catch Rainbow, Brown or Steelhead and, sometimes, Atlantic, Coho or Chinook Salmon. We recommend using Shooting or Wet Tip, medium or fast sinking: with medium or fast action rods, #6 to 8; fly selection for these species. 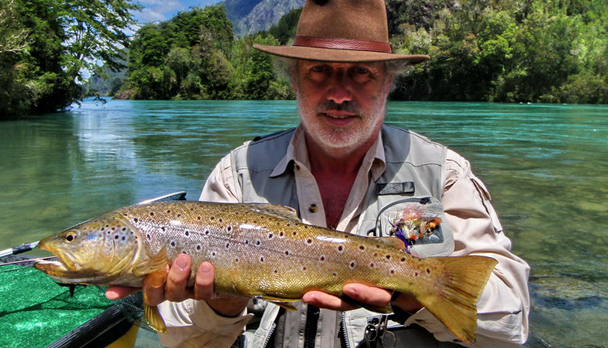 In Llanquihue river and Hueñu-Hueñu river, wade fishing on wonderful stream inlet on the banks of the lake. 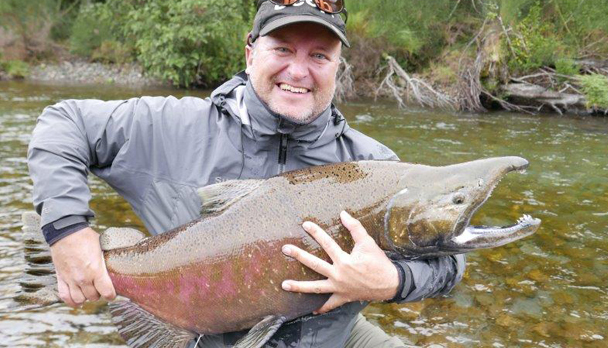 You could catch beautiful Rainbow Trout, medium and large (over 6 pounds); superb Atlantic and Coho Salmon. 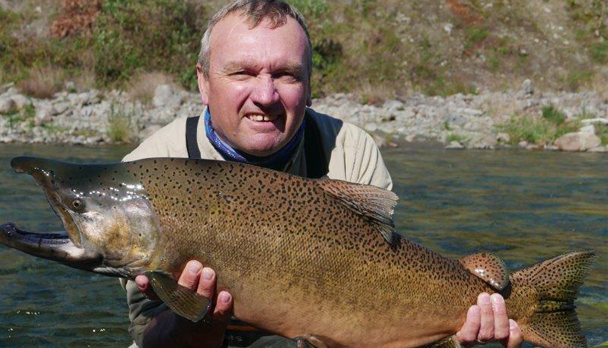 In Petrohué river, boat and wade fishing at the best spots of the river, where you could catch Rainbow, Steelhead, Brown, Sea-run and, sometimes, Coho, Chinook and Atlantic Salmon. We recommend using Shooting or Wet Tip, medium or fast sinking: with medium or fast action rods, numbers 6 to 8; fly selection for these species. In Rupanco River, wade fishing on wonderful inlets rivers on the south bank of the lake. 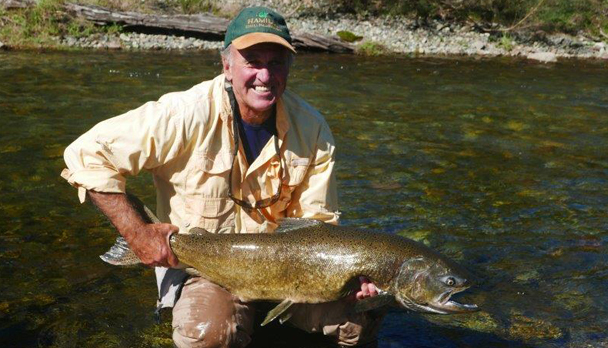 Where you could catch beautiful Rainbow Trout and, sometimes, Chinook and Coho Salmon. 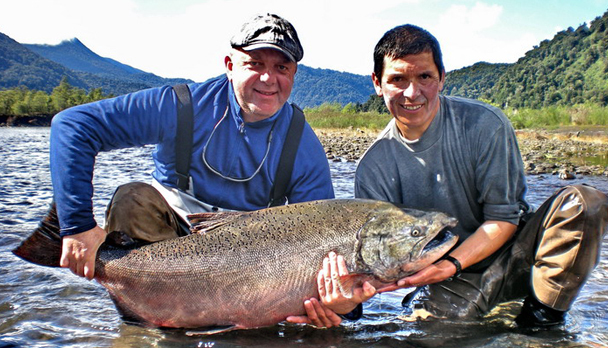 In the second section of the Petrohué river, boat and wade fishing at certain spots of the river and specially at tide´s affected spots of the estuary, where Steelhead, Coho and Atlantic Salmon get into the river flow, feeding in the sweet water. We recommend using Shooting or Wet Tip, fast sinking, with medium or fast action rods, #6 to 8; fly selection for these species. In Maullín river, boat fishing at the best spots of the river, where you could catch Rainbow, Brown, and sometimes Atlantic Salmon. 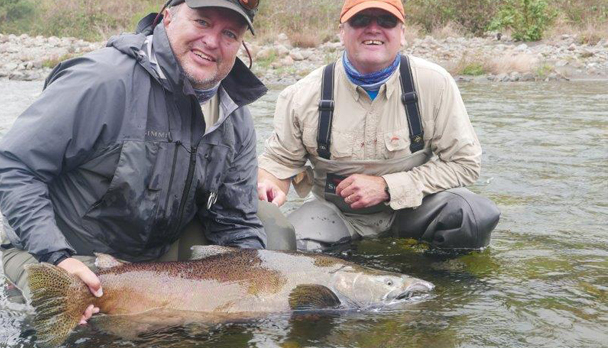 We recommend using Wet Tip line, medium sinking; medium or fast action rods, #4 to 6 and fly selection for these species. It is possible to agree packages with less days fishing. Transfer to the airport. End of the service. The Lodge has three apartments with two double rooms each, and four double rooms with private bathroom. A very nice Living room and restaurant with a spectacular view, a fly tying room and all the comfort necessary to have a delightful stay. Climatized swimming pool, sauna and a gym. For tout rods between #4 and 8, 9' minimun. Any reel with strong brake system and at least 150 yards backing. Lines WF Floating, Sinkingtip and Fastsinking shootings, type Teeny T 300/350.Breathable waders, rubber wading boots. Flies streamers for trout and the same to fish Atlantic Salmon and Brown Sea Trout. Rates include: Transfer in/out to the Lodge; 5-night accommodation with all meals; 4-day fishing with 1 guide x 2 anglers and boat; fishing licence. Rates do not include: Transfer to Pto. Montt. Personal health insurance; fishing equipment and flies; wines and/or spirits; gratuities. Salmon haven’t entered in quantity yet, but there are some in the river. It rained heavily, the first days and made for tough fishing, we did get some browns and rainbows but nothing large. I must be honest, the volcano ash from 2 / 3 years ago is still a factor, we had 10 inch trout chasing 4 inch flies, the system in my view, has very little food for the fish which have survived the ash. We probably landed more salmon than trout. We fished some side streams and there we landed some monster salmon, from around we guess 10 kg to close on 30 kg, some of the busses measured 1200mm in length , I have attached some photos. Thank you again for a fantastic trip. Chile. 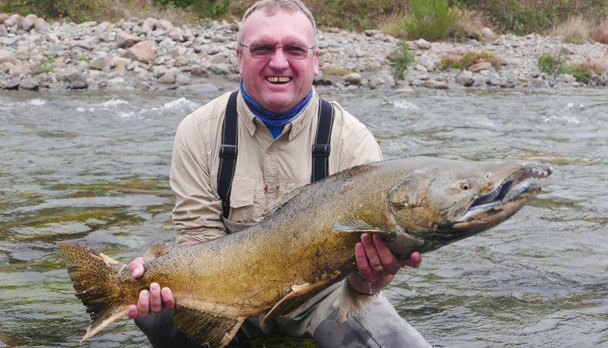 I was very pleased to be able to fish Rio Puelo !!!!!!!!! 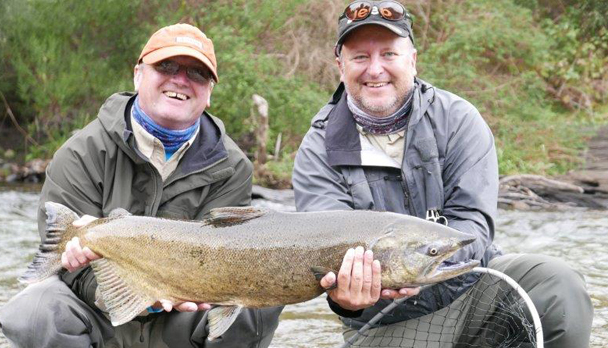 I promised to send you some of the best shots from my fishing trip to Rio Puelo in Easter Time. Well, I am badly late, but I never forgot it totally. I am still a beginner when it comes to underwater fotografing, may be because I bought the camera less than one year ago! But my personal opinion is that some of the fotos are really nice. I was very pleased to be able to fish Rio Puelo, and even more pleased to meet a Chilean guide who understands the essential of fly fishing (In my opinion, Chileans have a lack of experience normally). This guide, Fernando, first of all, asked whether it is ok if he also fishes∧ of course it was. From the very beginning I was feeling that he was more like a fishing friend, not just a hard working guide. He showed me the river in different places, and made me to meet some interesting fishes that were hard but possible to hook! For a person like me (fishing quite a lot), that is very important. Especially on my time in Chile when I was most of the weekends fishing alone. Who cares if you get only 5 trouts per day instead of 10 or 20? I am not only looking for a big fish, neither for big amount of them, but for nice moments in the nature. Right now, I remember well two moments: The one when I hooked a rainbow in a calm pool full of fallen trees, and the other one is the image of an other rainbow rising to my dry fly in the early morning sunlight. The fact is that I lost both of these fishes, but they gave good memories. 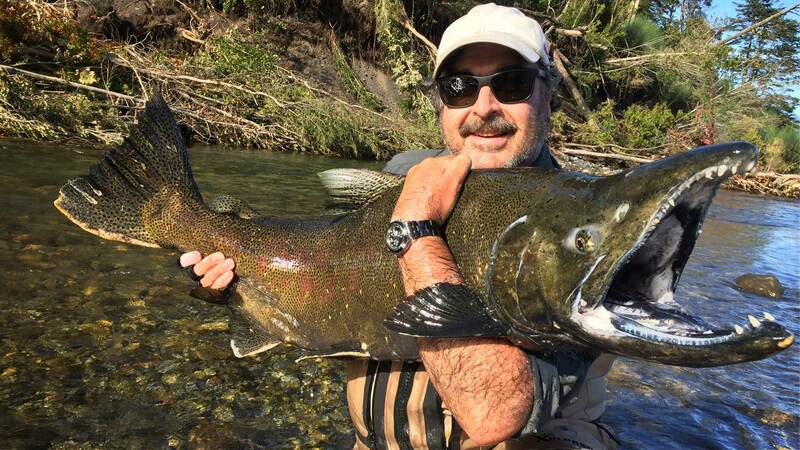 I hope that next time I can also see the salmons of Puelo; It would have been an adventure to ride horses to upstream of the river, to the place where salmons spawn and die! Unfortunately I did not understand to ask about that beforehand, and it was too difficult to arrange it with so short warning time. I am writing this at a hotel in Rouen, northern France, where I have started in a new project, after very long and relaxing summer holidays at home in Finland. Right now I do not know when I have the next possible work period in Chile. But I am totally fallen in love with South America, and sure will return at least for showing the fishing to my friends. You can be sure that I will contact you that day in the future. Chile. The whole trip was very memorable !!!!!!! A thousand apologies that it has taken me so long (I can't believe nearly 3 months) to get back to you. This year has just flown. I trust business is continuing well for you and we enjoy receiving your e-mails with the latest and greatest Flyfishing Caribe destinations. I have attached a couple of photos from our time at Ruca Chalhaufe & Ten Rivers & Ten Lakes. 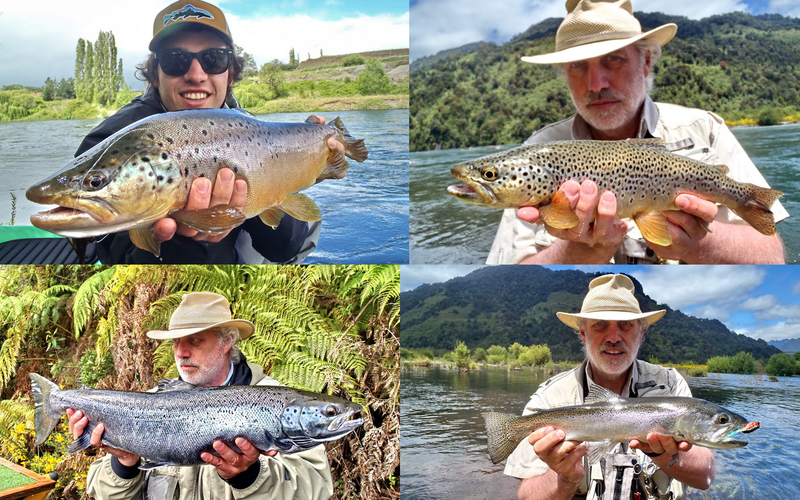 Over the 10 days at the 2 lodges, David caught 64 fish so he was pretty happy ! The weather conditions were quite challenging - very hot in Chile and then rainy & somewhat windy in Argentina, so he said it required patience but fortunately he has plenty of that when it comes to flyfishing. In Australia, apparently he fishes mainly with dry flies but in South America it was mostly wet flies so he was pleased to acquire some new skills and he also said he improved his streamcraft a lot. His trophy fish for the entire trip was caught on the very last day in la boca del Rio Chimehuín - a 7lb salmon on a 6 weight line. This was his first salmon to catch on the fly so he was very excited when he returned that night ! It was a very cold, wet, windy day but according to his guide, Jorge Bisso, the exact conditions needed to catch a fish like this. A picture is attached. David said his guides at both lodges were excellent and he appreciated that they were fluent in English. David has a very strong Australian accent so he is not altogether easy to understand ! As for me, my activities were superb. The hiking guide in Chile took me on 2 quite different treks - one on Osorno and the other to Cayute Lagoon. Osorno really is so majestic and I enjoyed seeing it from different angles - on Todos Los Santos and also when rafting on the Petrohue. The rafting is a great trip and is to be highly recommended. My trip to Chiloe Island was with 2 guides from Ruca Chalhaufe and we had a memorable day. We covered a lot of territory and had many laughs along the way. The lodge staff were terrific - food and wine were great and I felt they went to a lot of effort to accommodate my activities what with having to transport me around, in addition to the fishermen. Ten Rivers and Ten Lakes is really very special in terms of the standard of rooms; the restaurant; and of course, the wonderful location - certainly more luxury accommodation rather than a fishing lodge. Again, our hosts couldn't do enough for us. The guides which accompanied me from desde la Patagonia were exceptional - they specialise in tailoring activities for small groups. The only disappointment was that the weather closed in and I was not able to do the planned ascension of Lanin. But I enjoyed some great kayaking on the lake and a couple of good treks on some of the lower peaks. It was also very nice just to enjoy the amenities at TR&TL. The good thing is that I now have a very good reason to have to go back to San Martin - to climb Lanin ! We enjoyed the town very much and thought the restaurants and shoppping were excellent so we definitely plan to return one day soon. The whole trip was very memorable and we can't thank you enough for the time and effort you put into helping us plan it - especially in regards to my activities. We would be more than happy to be a reference for FlyFishing Caribe so please feel free to give our e-mail address to prospective clients. We'll be sure to remain in touch.